A BJP convoy was attacked by Naxalites in Chhattisgarh’s Dantewada on Tuesday evening, the attacks killed five, including a BJP MLA on poll duty. The Naxals triggered an Improvised Explosive Device (IED) on the convoy. Dantewada BJP MLA Bheema Mandavi died in the attack, his vehicle was the last in the convoy. 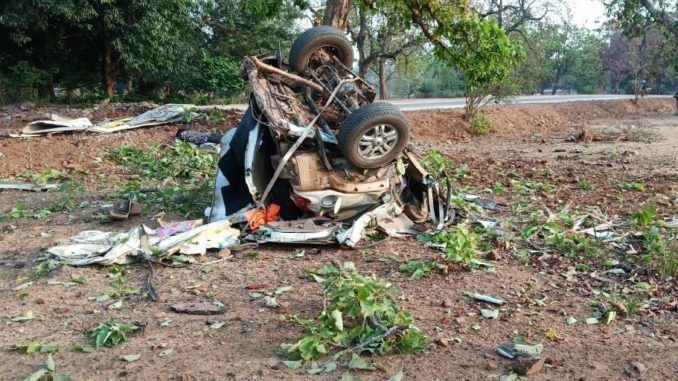 Three policemen, a driver and the BJP MLA were killed in the Naxal attack. A group of BJP leaders, including the MLA was travelling for the upcoming Lok Sabha elections when it was targeted by the Naxals. After the incident the security agencies will be looking into as to how the Maoists got to know the movements of the MLA, especially since such plans are made only hours in advance. The explosion was so powerful that human remains were flung almost 50 metres away from the point where the IED was planted. Just before the assembly elections in November last year, two policemen and a Doordarshan cameraman were killed not very far from Nakulnaar in Dantewada district in a similar Naxal attack. In another such incident at the same time, Nandlal Mudami, a district panchayat member was attacked by Maoists at his house in Palnaar village. Dantewada falls in the Bastar Lok Sabha constituency, which will go to polls in the first phase on the 11th of April.